As Illinois muni debt continues to hover around all-time highs, the number of watchdog groups offering warnings about Chicago's deteriorating finances continues to grow. The latest such warning comes from Truth In Accounting which provided the Windy City an 'F' on their latest fiscal report card citing a staggering debt burden that amounts to $41,700 per Chicago resident. To put that figure in perspective, the median household income in Chicago is roughly $48,500. Despite an array of tax increases to help shore up the city's underfunded pension plans, Chicago has received an "F" grade for its financial health, according to a new analysis by the non-profit government finance watchdog group Truth in Accounting (TIA). Repeated decisions by city officials have left the city with a staggering debt burden of $37.4 billion, according to TIA's analysis of the most recent financial filings. That burden equates to $41,700 for every Chicago taxpayer. Chicago's financial problems are largely driven by runaway entitlement obligations in two categories: pensions and retiree healthcare benefits. The city has promised to pay out $35.8 billion in pensions and $715.5 million in retiree healthcare benefits. While Chicago has promised these benefits, little money has been set aside to fund them. These statistics are jarring, but what's more alarming is that city government officials continue to obscure significant amounts of retirement debt from their balance sheets, despite new rules to increase financial transparency. This skewed financial data gives residents a false impression of their city's overall financial health. Of course, the repeated warnings about Illinois' spiraling pension crisis continue to be of absolutely no concern to muni bondholders who continue to push general obligation bonds to new highs with each passing day. 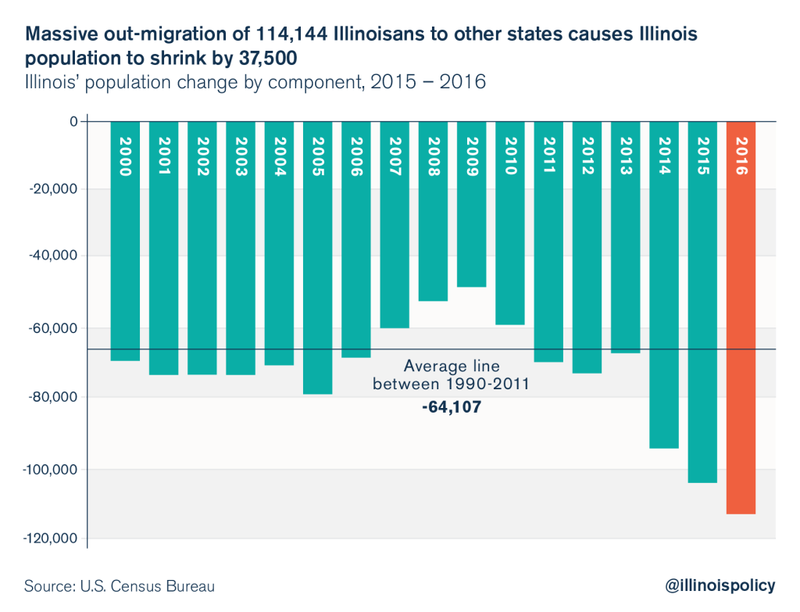 ...to put this massive domestic migration into perspective, Illinois loses 1 resident every 4.6 minutes.